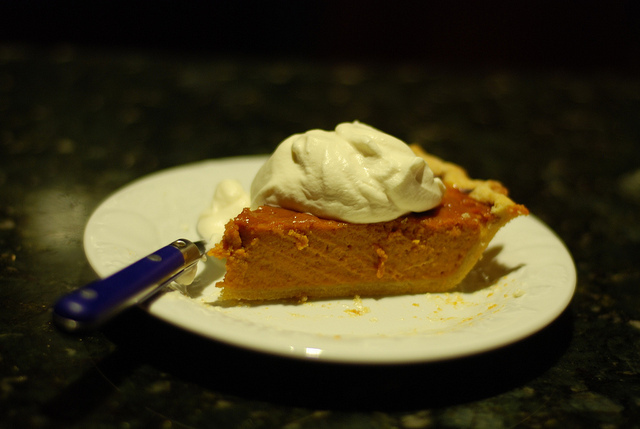 A slice of pumpkin pie with whipped cream. I made this last Thanksgiving. Today is Thanksgiving in the United States. It’s possibly my favorite holiday (read more about holidays in general here), but most people here in Costa Rica don’t know anything about it. So today let’s explore what the holiday is about! Many of these words –especially about foods– may be new or strange for you, so I’ll include definitions or explanations for the bold words at the end of the post. First of all, Thanksgiving is an old holiday. The history of Thanksgiving is a bit complicated, though, and there are different ideas about the “first Thanksgiving.” You can watch this video or any of the others on History.com if you want more general information about the holiday’s history. For today I just want to focus on the modern celebration. Thanksgiving is celebrated in the US on the fourth Thursday of every November. Most people generally have Thursday and Friday off from work or school, so generally people try to get together with friends and family for a big meal (sometimes called “Thanksgiving dinner” or a “feast“). Different people eat different foods for Thanksgiving, but the most common food is definitely turkey. As sides, people often eat cranberry sauce together with the meat –it may sound weird, but it’s delicious! Additionally, people often eat mashed potatoes with gravy, bread or rolls, stuffing, and save the most delicious thing for dessert: pumpkin pie! It’s a special time of year, and I think one of the best things about the holiday is that it’s not commercial, and that it’s just about spending time with loved ones and being thankful for the good things in your life. Many times people take turns saying what they’re thankful for in their lives. 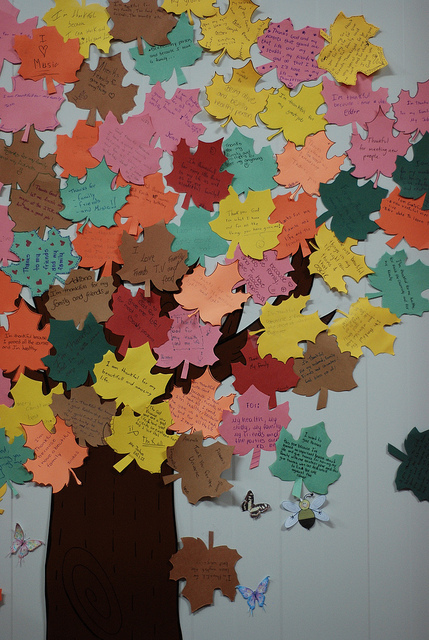 At the old school where I used to teach, the students wrote what they were thankful for on a paper leaf. What are you thankful for in your life? Let’s go over some of the vocabulary for today. Before you read the definitions, though, can you explain what each of these words means? So, what about you? What are you thankful for? I’m thankful for you, for reading this blog! If you have any comments or questions, please leave a comment. Thanks again for reading, and Happy Thanksgiving!